The facts are clear—growing up without a loving and caring father can be detrimental to a child’s emotional and spiritual health. 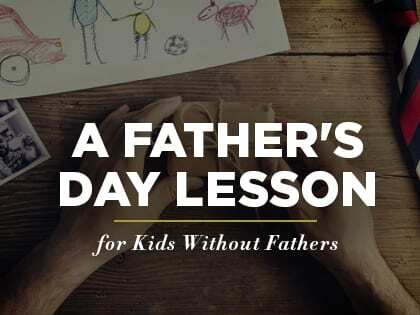 So, this year, instead of sending kids home with a handmade card or craft for their dad, use Father’s Day as an opportunity to remind children of their heavenly Dad—all the ways he takes care of them and wants to hang out with them. Then, start intentionally and regularly investing in the lives of children whose earthly fathers are absent. Remind children of their heavenly Father with these words. He is a perfect Father. He will never break a promise. He will never hurt you. He will never treat you badly. He will never leave you (Hebrews 13:5). He is absolutely perfect in every way. He has a perfect love. Because God is your perfect Father, he loves you with a perfect love. He’s not like those who told you they loved you, but then when you did something they didn’t like, they withheld their love from you. God’s love is so much bigger and stronger than anything we have ever imagined. The Bible says that “God is love” (1 John 4:8). That means he has so much perfect love for you that it’s as if love is all that he is made of. The best part is, no matter what you do, his love stays the same. You might think, “Well, what if I let God down and make a mistake and sin? Will he still love me then?” The answer is, “Yes!” God’s perfect love never fails and it never stops. No matter how much you ignore him, disobey him, or hurt him—God still loves you with his perfect love. He has a perfect plan. Not only is God a perfect Father who has a perfect love for you, but he has a perfect plan for your life (Jer. 29:11). You don’t start to build a building without a plan. If you do, your building will probably turn out looking pretty messed up. You need to know exactly what you want it to be before you start, right? Just like that, God had a plan for you before the world was created. God had a perfect plan for you even before you were born (Jer. 1:5). He knew who your friends would be, what you would grow up to become and every little detail about you. God’s perfect plan for you is what you need to follow. If you want to know what his plan is for your life, just ask him (James 1:5). He speaks to you through the Bible and in your heart and thoughts. He will help you make decisions. He will help you do all the things that will help you become more of the person that he planned for you to be. The best news of all? There is nothing that anyone else can do to stop God’s plan for you. The devil can’t stop it, people can’t stop it, nothing can stop it (Job 42:2). Brian Dollar has been a kids pastor since 1992. His passion for training and equipping other Kids Ministry Leaders to be effective in their churches has led him to be a featured speaker at many children’s pastors’ conferences, seminars, camps and retreats. Check out Brian Dollar’s book, Talk Now and Later: How to Lead Kids Through Life’s Tough Topics (Salubris, 2015), a 2015 Outreach Resource of the Year.